Well, this is charming as hell. In the tiny Nova Scotian town of Sandy Cove (population 65), 12 women, a toddler and two men took to the street on Saturday. They played instruments, and brought posters and smiles as they marched in solidarity with the Women’s March on Washington. Gwen Wilson and Melissa Merritt, two friends who have lived in the remote Canadian town their entire lives, organized the march after realizing that their closest local march was in Halifax, which is a two-hour drive away, reported CBC News. The friends told the Toronto Star that they made a Facebook event for their march and expected about three people to show up. They were elated when 13 people came. 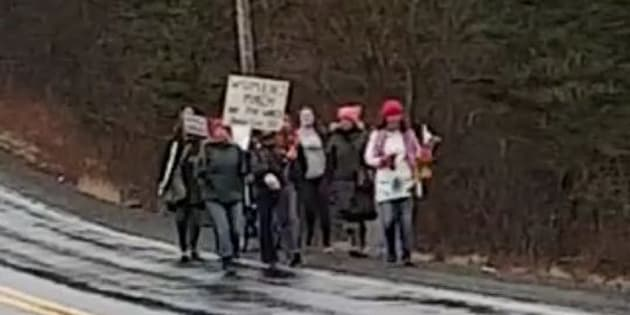 In drizzly weather, the group walked along Highway 217 — the only road that runs through Sandy Cove — for about an hour as cars passed by. Later that day, Kadijah Photiades, a local woman who showed up for the march, posted a video of the tiny protest to her Facebook page. Since Saturday, the video has been viewed more than 157,000 times. One woman said she had looked at all of these marches all around the world,” Photiades. “And it wasn’t until she saw our little tiny march in Sandy Cove that she actually burst out crying"Kadijah Photiades, one of the marchers. Viewers also left some very lovely comments underneath the video. “I’m so proud of you women. Thank you for the support… from Sacramento, California, where we were 20,000 strong. But I’m certain your group had had every bit as much spirit as we,” one commenter wrote. Photiades told CBC that online their little march has had a much bigger impact.